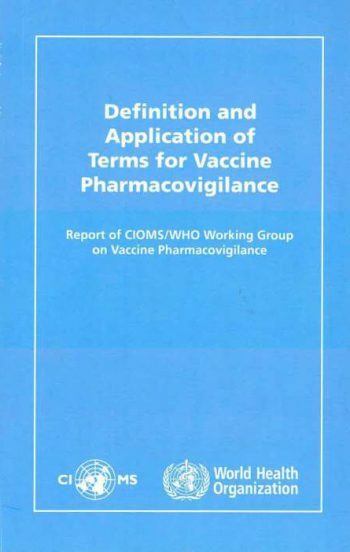 This report covers the activities and outputs of the CIOMS/WHO Working Group on Vaccine Pharmacovigilance (2005-2010) and is published in its full version as a PDF file on the websites of CIOMS and WHO. 3. Collaborate with other CIOMS working groups especially that on Standardised MedDRA Queries (SMQs) and CIOMS VIII on Application of Signal Detection in Pharmacovigilance. The Working Group was composed of members from the pharmaceutical industry, regulatory agencies, governmental institutions, and academia both from industrialised and developing countries as well as from international organizations. The aim of the group was to complete a final document including all general definitions as well as the Introduction and Definition sections of all endorsed Brighton Collaboration definitions by the end of 2010. May 27-28, 2008 in London, UK. During the mapping process, concepts in the case definitions that are not already part of MedDRA were identified. These findings made the WG decide to make a recommendation to the Brighton Secretariat that Brighton working groups consider MedDRA terms when developing new definitions. Comments regarding various Signal definitions were sent to CIOMS WG VIII. A vaccine-specific point-to-consider document as an annex to Signal definition in collaboration with CIOMS WG VIII was finalized. The WG recommended that a drug dictionary for vaccines is needed and supports the Uppsala Monitoring Centre (UMC; WHO Collaborating Center for International Drug Monitoring) in their efforts in this respect.